The Solid State drive was revolutionary when it was first introduced but for the past few years, SSD performance has stagnated somewhat partly because of bottlenecking on SATA 3.0 and so many manufacturers instead focussed their efforts on better features such as software enhancements and better security encryption. There has been little uptake on PCIe storage despite the leap in performance due to the high cost in comparison to an SSD. Plextor look to rectify this with their M6e. This PCIe SSD is targeted toward gamers who desire the speed, ease of setup but who don't wish to pay through the nose to get that boost in performance. The M6e, as we shall see satisfies on both fronts. The M6e comes in two flavours, the vanilla M6e and the Black edition which is much more pleasing to the eye and encompasses a range of evolutions from the standard M6e we have for review today. That said, the standard M6e has a lot to offer both in terms of performance and features which we will examine over the following pages. The Plextor M6e comes in three different storage sizes: 128GB, 256GB and 512GB and has a combination of the latest Marvel Controller and Toshiba toggle NAND Flash. 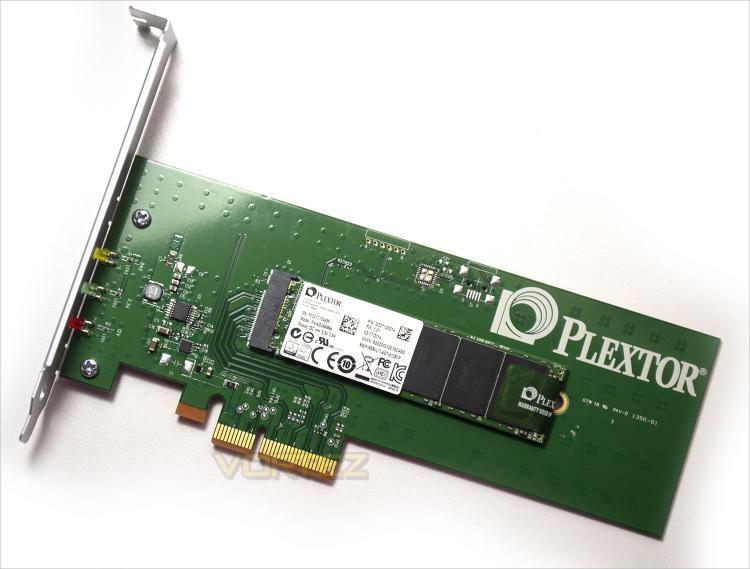 Be more productive with a lightning-fast Plextor M6e PCI Express Series SSD.With the PCI Express interface, the M6e PCI Express bypasses the standard SATA connection bottleneck, thus drastically shortening the start time in many of today’s systems. Operating more efficiently than traditional SATA SSDs, the M6e PCI Express consumes less power, which extends your system’s battery life. The M6e PCI Express also features True Speed technology, an exclusive firmware feature that works to prevent SSD speed drops and automatically maintains performance. With blazing fast random access speeds of up to 105,000 IOPS and sequential access speeds of up to 770 MB/s, the M6e PCI Express Series SSDs are built to provide superior and consistent performance for years to come. Download large files in seconds rather than minutes and access your stored movies, games, photos and music quickly and easily.